The Alaskan Malamute /ˈmæləˌmjuːt/ is a large breed of domestic dog (Canis lupus familiaris) originally bred for their strength and endurance to haul heavy freight, and later as a sled dog. They are similar to other arctic breeds and spitz breeds, such as the Greenland Dog, Canadian Eskimo Dog, the Siberian Husky, and the Samoyed. Although it is believed that the first dogs arrived in the Americas 12,000 years ago, people and their dogs did not settle in the Arctic until the Eskimo people 4,500 years ago and then the Thule people 1,000 years ago, both originating from Siberia. 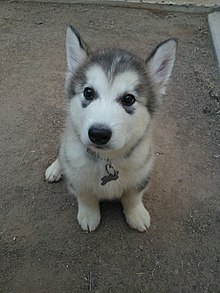 Malamutes were bred by the Malemiut Inupiaq people of Alaska's Norton Sound region, who were a Thule people. The usual colors are various shades of gray and white, sable and white, black and white, seal and white, red and white, or solid white. There are a wide range of markings in the breed including face markings, blazes, a splash at the nape of the neck, and a collar or half collar. White is often the predominant color on the body, parts of the legs, feet and part of the markings of the face. 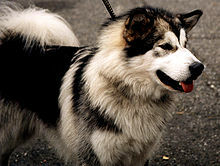 In terms of color variants, some Malamutes exhibit a dark grey to buff-colored undertone around their trimmings and white areas, presenting with a color-linked gene known as 'Agouti'. Two agouti alleles, with the possibility of a third, appear to be found in Malamutes: 'aw' (Agouti Pattern or Wolf/Wild Pattern), 'at' (Tan Point Pattern or Black Pattern), and 'awat' (Heterozygous Agouti or Dark Agouti). The Malamute has a long genetic foundation of living in harsh environments, and many of its behaviors have adapted to survive in such environments. Independence, resourcefulness, high intelligence, and natural behaviors are common in the breed. Malamutes, like other Northern and sled dog breeds, can have a high prey drive, due to their origins and breeding. This may mean that in some cases they will chase smaller animals, including other canines, as well as rabbits, squirrels, and cats. While Malamutes are, as a general rule, particularly amicable around people and can be taught to tolerate smaller pets, it is necessary to be mindful of them around smaller animals and small children. Malamutes are very fond of people, a trait that makes them particularly sought-after family dogs, but unreliable watchdogs. Malamutes are nimble around furniture and smaller items, making them ideal house dogs, provided they get plenty of time outdoors meeting their considerable exercise requirements. Alaskan Malamutes also often participate in animal therapy programs, like visiting patients in hospitals, due to their soft nature. If they are year-round outdoor dogs, letting them play in a baby pool filled with cold water in summer keeps them cool. In the winter, they prefer snow. Malamutes are usually quiet dogs, seldom barking. When a Malamute does vocalize, it often appears to be "talking" by vocalizing a "woo woo" sound. It may howl like a gray wolf or coyote, and for the same reason. A similar-looking Spitz dog, the Siberian Husky, is much more vocal. (AKC) "Breed recognition came in 1935, largely through the efforts of Mrs. Eva B. Seeley. At that time many dogs were of unknown ancestry. Those who appeared purebred were used for breeding, others weeded out. After a few years the registry was closed." "Losses from service in World War II all but eliminated the breed. In 1947 there were estimated to be only about 30 registered dogs left, so the stud book was reopened. Robert J. Zoller became involved in the breed and took this opportunity to combine M’Loot and Hinman/Irwin dogs with selected Kotzebues to create what became the Husky-Pak line. All modern Malamutes are descended from the early strains, and show combinations of characteristics in greater or lesser degree. Thus the natural differences we see today." In 2018, researchers at the University of Washington recorded the behavior of an Alaskan Malamute by attaching sensors to its paws, torso and tail, allowing them to capture its normal movements. The data was entered into a machine learning system with the aim of predicting the dog's behavior in various situations. The predictive ability of the software was only limited to short time frames, but it was able to identify 'walkable' surfaces after observing the dog walk on, or avoid, certain surfaces. A 2000 investigation published in the Journal of the American Veterinary Medical Association examined the "Breeds of dogs involved in fatal human attacks in the United States between 1979 and 1998". The journal authors made several notes on the original article, including the fact that police dogs were excluded from the numbers. PitBullInfo.org, a website published by a not-for-profit organization, calculated breed-specific risk rates by adjusting fatality incidents relative to the breed's population size. The Malamute was responsible for 6.79 bite-related fatalities per 100,000 dogs (for every 100,000 Malamute dogs, about 7 people will die from a dog bite). The second-highest fatality rate was the Chow Chow at 2.32. Pitbull-type dogs came in at 0.97. ^ a b Brown, S K; Darwent, C M; Wictum, E J; Sacks, B N (2015). "Using multiple markers to elucidate the ancient, historical and modern relationships among North American Arctic dog breeds". Heredity. 115 (6): 488. doi:10.1038/hdy.2015.49. PMC 4806895. PMID 26103948. ^ Handford, Jenny Mai (2009). "Dog sledging in the eighteenth century: North America and Siberia". Polar Record. 34 (190): 237. doi:10.1017/S0032247400025705. ^ Ehsani, K; Bagherinezhad, H; Redmon, J; Mottaghi, R; Farhadi, A (March 28, 2018). "Who Let The Dogs Out? Modeling Dog Behavior From Visual Data". arXiv:1803.10827 [cs.CV]. ^ Sacks, Jeffrey; Sinclair, Leslie (September 15, 2000). "Breeds of dogs involved in fatal human attacks in the United States between 1979 and 1998" (PDF). Journal of the American Veterinary Medical Association. 217 (6): 836–840. doi:10.2460/javma.2000.217.836. PMID 10997153. Retrieved November 12, 2018.